A soul-searching look at Jewish identity, Yearning To Belong poses difficult questions about the politics of modern faith. Capturing the spiritual plight of the Abayudaya people of Uganda to be accepted into the Jewish fold, the film shows just how divided worldwide opinion is on what it takes to be called a Jew. The Abayudaya’s conviction to Jewish faith goes back almost 90 years. Delving into the history of this unique people, the film explains that by 1919, Kakungulu (a Christian preacher until an epiphany led him to embrace Judaism) had convinced 3,000 of his community to follow the ancient example of Abraham and receive circumcisions. And while he did his best to ensure that other Jewish rites were adhered to, the community’s remote location made proper rabbinic access impossible. 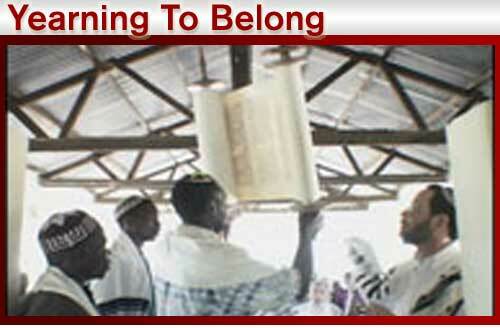 In early 2002, however, five Conservative rabbis agreed to journey to Nabugoye Hill in rural Uganda to fulfill the Abayudaya’s request that they be formally converted to Judaism and accepted into the larger worldwide Jewish community. Filmmaker Debra Gonsher Vinik and her crew followed along, and their resulting film captures an extraordinary bridging of cultures in the name of spreading the faith. Those generations have weathered the passage of both time and dictators. During the 1970’s the Abayudaya’s mud hut synagogues and lands were confiscated by the government of Idi Amin, and they were barred from publicly practicing Judaism. After Amin was overthrown and freedom of worship restored, uncertainty and religious malaise fell over the community, until a youth movement reinvigorated the faithful. Vinik’s camera now tracks two of the leaders of that movement, Gershom Sizomu and his brother J.J., as they visit the U.S. to drum up public support for acceptance of their conversion. Gaining acceptance by all branches of the Jewish community proves difficult, however. Vinik arranges for a meeting with rabbis from three different Jewish denominations, and the camera is rolling when the brothers are told how their status as Jews is questionable based on the narrow definitions of Orthodox conversion. Later, Vinik asks noted theologian Rabbi Ismar Schorsch about the reasoning for such “inflexible” spiritual stances. “The sad fact is that conversion in Judaism has become a power struggle between Orthodox and the non-Orthodox, to the great detriment of the Jewish people,” he says. Hoping to illuminate that struggle, Vinik goes on Rabbi Joseph Potasnik’s radio show to plead the Abayudaya case. Vinik criticizes the “circular reasoning” of those who refuse to include the Ugandan community based on a lack of Jewish “infrastructure,” like religious schools and kosher butchers, yet are also loath to provide support that would likely aid the building of such institutions. Just how soon official Jewish acceptance is granted to the Abayudaya remains to be seen, but the film makes a powerful case for a community of believers willing to do whatever it takes simply to belong.